His mother wanted him to be a dentist but thankfully Oliver Graham-Jones, with his interest and passion for caring for animals and wildlife at a young age, chose a career as a vet that would end up changing the face of veterinary techniques at zoos. After owning and running his own veterinary clinic, landed a job as the first resident vet at the then Regent Park Zoo (now London Zoo) when he was appointed Curator of Mammals and Veterinary Officer to the Zoological Society of London (ZSL) in 1951. 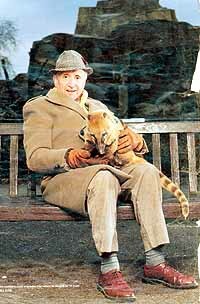 In the early days Oliver Graham-Jones lived right on zoo grounds, in a house between the seals and the gazelles. How many people can say they’ve lived at a zoo? At the time there was no real specific training as well as little literature for vet work in zoos so Oliver with his previous domestic animal vet knowledge did a lot of improvising. Thanks to his improvisations we now have many important innovations that he introduced. Some of these innovations are; the ‘flying syringe’ which is a syringe loaded in a rifle or air pistol for swift and humane tranquilizing, the need for a fully equipped animal hospital with an operating theatre and quarantine enclosures as well as the need for an animal out-patient clinic. Oliver Graham-Jones also implemented infra-red pool heating lamps for the monkey house as well as flaps on the entrance/exit to the animal enclosures so they could choose to go in or out to stay warm or cool down. Oliver Graham-Jones had around 6,000 animals of various species in his care so it’s no surprise that he encountered very diverse problems. Some of his patients included; a cockroach with a throat infection, a gorilla with a hernia, a python with internal blockage, a mouse with breast cancer and a raven from the Tower of London who needed a wooden leg. Remarkable! His commitment, dedication and results made him quite sought after for care of notable animals like Guy the gorilla, Cholmondeley the chimp, Goldie the golden eagle as well as Winston Churchill’s lion, Rota. 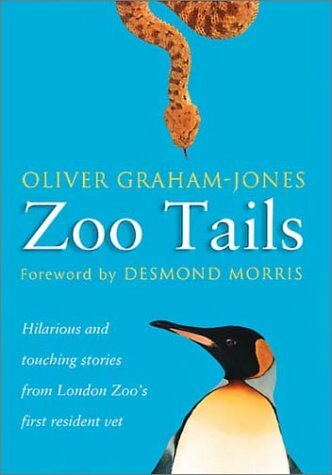 To read more about Oliver Graham-Jones’s time as a vet at the now London Zoo check out one or all of his books. The witty and entertaining “Zoo Tails“, “First Catch Your Tiger” with an introduction by Gerald Durrell and “Zoo Doctor“.